All about quality chopsticks. Have you ever wondered how chopsticks are made and the difference between a simple pair of chopsticks and nice special pair? This simple guide will tell you all about quality chopsticks. Chopsticks are available in several levels of quality and craftsmanship from lowly disposable chopsticks, hardworking everyday chopsticks and artisan or luxury chopsticks. Disposable chopsticks are made in several Asian countries with The nicest disposable chopsticks are made in Japan to high standards of quality and finish. China produces the most of the world's disposable chopsticks, producing over 80 billion pairs each year. 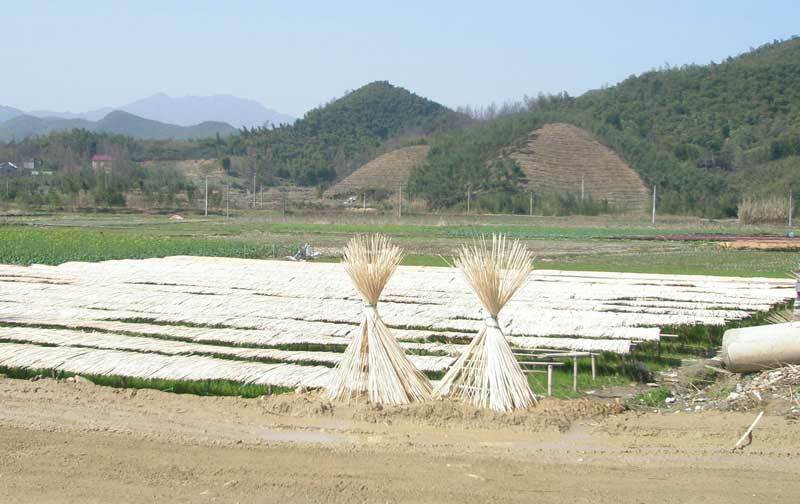 Disposable chopsticks are typically machine mass produced though in some poorer countries there are village disposable chopstick factories where chopsticks are cut and produced by hand. Bamboo is the most common material used for disposable chopsticks as it is fast growing and has a straight grain, however wood chopsticks account for almost half of the production consume millions of trees each year. Recently toxins in disposable chopsticks have come to light as sometimes sulfur, hydrogen peroxide or sodium sulfite are used in excessive amounts as a mold inhibitor even though they are regulated by China's government. We at Everything Chopsticks prefer people take their own non-disposable chopsticks when eating out or frequent restaurants that use non-disposable chopsticks. Everyday chopsticks are chopsticks manufactured and finished so they will last for several years under normal everyday use. Everyday chopsticks are made of bamboo, wood, plastic and metal. They are typically low cost - about $1-$2 a pair for Chinese made chopsticks and $3-$8 a pair for Japanese made chopsticks. Bamboo and wood chopsticks will have a paint finish made of several layers. Usually they will incorporate a design applied like a decal prior to the final clear coat. 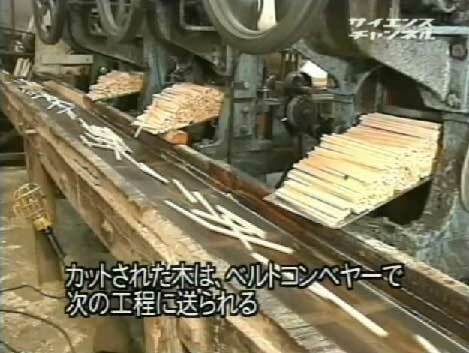 Bamboo and wood chopsticks should be washed by hand as detergents and machine washing will degrade the finish. Chinese produced everyday chopsticks come in a few levels of quality from Domestic to Japan Number One. The quality of base material, number and quality of paint layers, and quality of inspection determine the difference and price. At Everything Chopsticks we only sell Japan Number One quality everyday chopsticks from China. Japan Number One chopsticks are a good and generally solid chopstick. Japanese manufactured everyday chopsticks are of even better quality, with finer base wood, more layers of paint with better attention to sanding and finishing between coats and nicer decal or paint designs. This results in a superior quality chopstick that will last longer, look better and is worth the extra cost. Besides painted wood or bamboo chopsticks there are increasing numbers of plastic and metal chopsticks. Plastic chopsticks from China are inexpensive and are generally not as nice as those made in Japan, where the attention to detail and finish produces a better chopstick. Metal chopsticks are almost always made of stainless steel and produced in China or Korea. They are typically excellent and will last a lifetime with proper care. Both plastic and metal chopsticks usually can be washed in a dishwasher. Beyond everyday chopsticks are chopsticks made in smaller quantities using manufacturing techniques requiring more skill and production time. Although it is possible to find some unique and luxury oriented chopsticks from China, Japanese produced artisan chopsticks take quality chopsticks to higher levels. 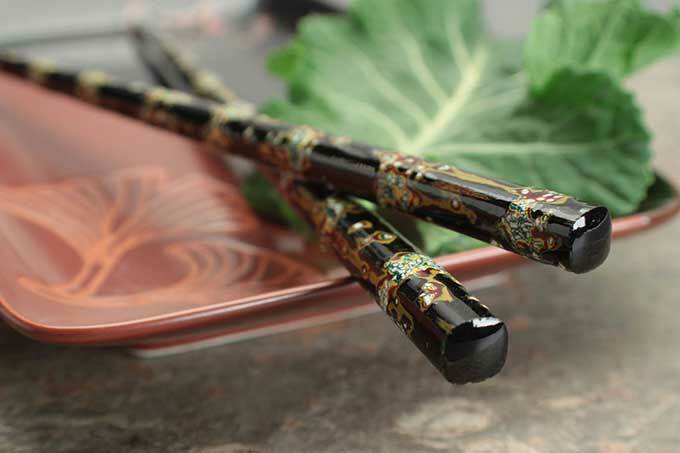 These chopsticks may be made of traditional lacquers, painted 20 to 100 layers thick, carved and shaped to reveal the beautiful colors and designs. These are called Wakasa chopsticks. Another artisan chopstick applies traditional brocade fabric to the handles of chopsticks called Nishijin. Similar of sorts is the application of handmade Washi paper onto chopstick handles. These Japanese artisan chopstick manufacturing techniques have been perfected over centuries and are threatening to become endangered as mass production in China erodes market share and young people in Japan are less inclined to work in small shops learning the trade. Please visit Everything Chopsticks and see all the beautiful chopsticks.